Say you want to send out a regular email newsletter or some ad hoc email updates to a bunch of people. It could be emails to people that have made individual donations to your project. It could be an email campaign promoting family planning services in a target country. It could be emails to previous project volunteers you’ve had over the years. Email is a very widely used communication tool and can be very effective when going out to large groups of people. Over the years, I’ve probably used about a dozen different email marketing tools. They’ve come a long way in that time and they’re now cheaper, easier to use and have better features than ever before. This is a review of MailChimp. I’m a big fan of MailChimp and have used if for different projects/clients since 2008. Keep in mind that there are literally dozens (hundreds?) of alternatives to MailChimp… so if you find that you don’t like the system or that it doesn’t meet your requirements for whatever reason, then there is likely to be another provider out there for you. 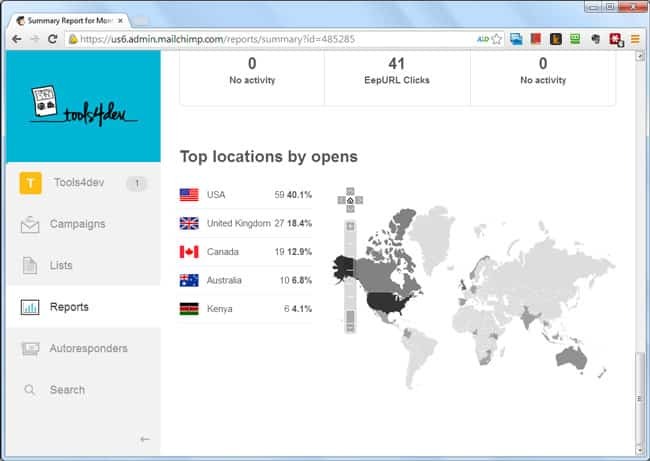 Email Marketing Tools (also called Email Service Providers, Email Marketing Systems, etc.) provide mostly online systems for creating emails, managing lists of subscribers, creating and sending your emails to those lists, and tracking the results. Can’t I just use Gmail / Yahoo! Mail / my work email? To send an email campaign, you need a list of subscribers. MailChimp is pretty insistent that you actually have permission to email these people, and with good reason. If you don’t, you could be sending spam (unsolicited email), and you’re using their system to do it. It is a good idea to check the anti-spam laws in your country (and in the USA, because MailChimp is based there) to see what the rules are for sending out emails en masse. 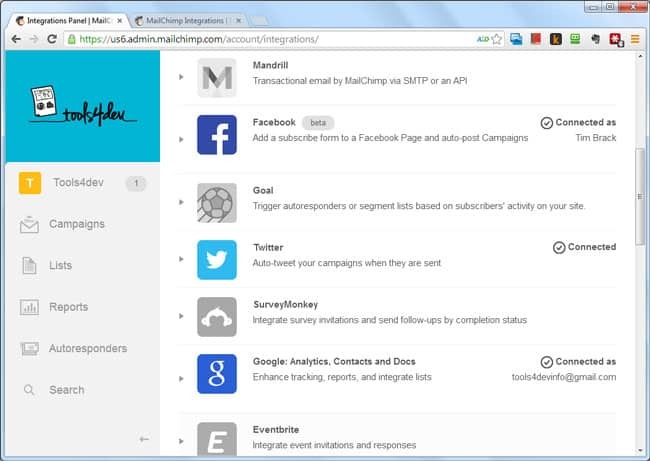 MailChimp gives you a few options for adding your subscribers. 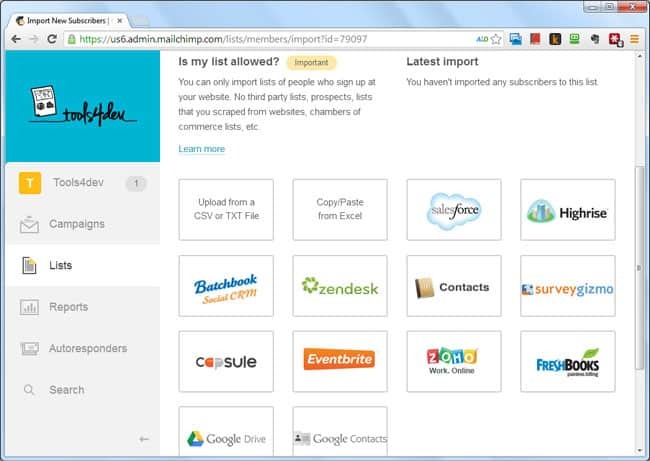 You can input them manually, bulk upload them via a CSV or TXT file, copy+paste from Excel or even connect MailChimp to your own system if there is an integration available (e.g. if you’re using Google Docs, Highrise, Salesforce.com, etc.). 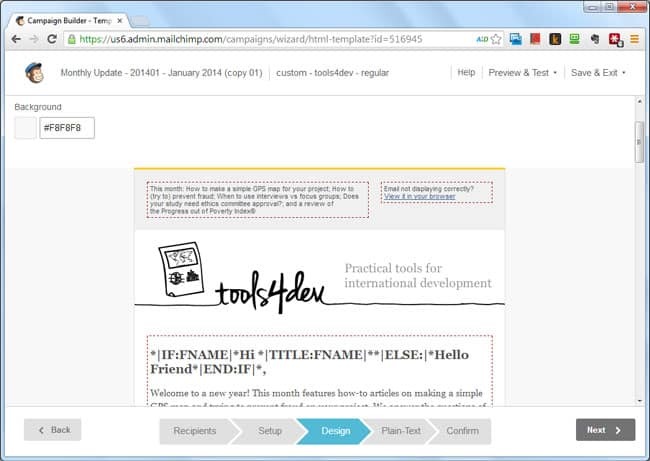 Or you can just duplicate an existing email campaign and start editing that in their email editor. There is also a well documented FAQ / Knowledge base with video guides should you get stuck. 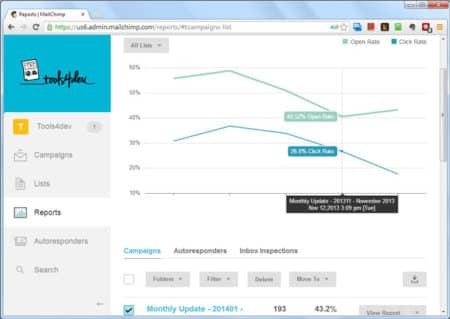 After your email campaign has gone out, you’re going to want to see how it did. 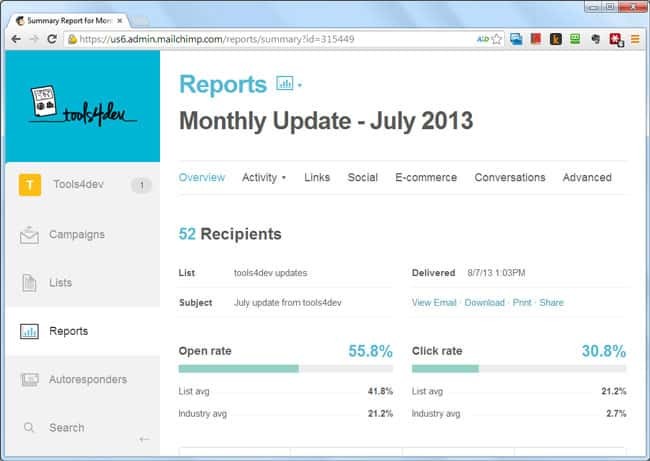 MailChimp has handy reports on all the what happens to your email. 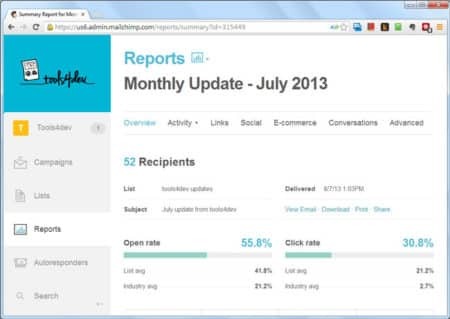 Things like open rate, click-through rate, unsubscribes are quite important measures for seeing how your email campaign did (and they also help create a funnel to the final goal of your email if it is meant to achieve something else, like a donation through your website or viewing of a video or downloading a report, etc.). MailChimp has two payment models, you can either pay a set-cost per email that you send out (bought in batches of email credits), or you can pay a flat fee per month based on how many subscribers you have. Check out MailChimp’s pricing page to see the the details of each plan. 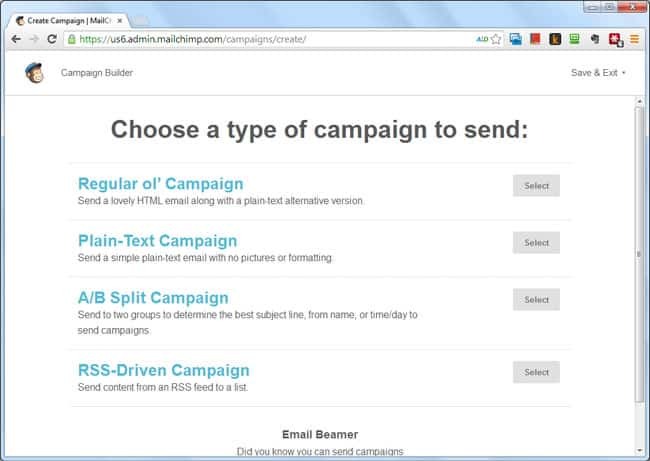 MailChimp delightfully provides a free version of their email service as well, which is actually quite feature rich. The free version of their product allows you to send up to 12,000 emails per month (at time of writing) and have up to 2,000 subscribers. Note that if you want to go over either of these numbers or if you want one of the other features that are only available to paid accounts, then you will have to switch to either a cost-per-month or cost-per-email structure. MailChimp also offers a discount of 15% to non-profits and charities. As I’ve mentioned before, I really like MailChimp and the system even has a quirky sense of humour. The process for setting up the email campaign and putting in the content is fairly straight-forward and linear. 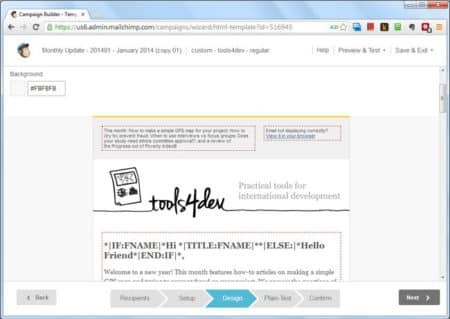 If replicating/duplicating an email campaign, make sure to remember to change the subject line of your email! It can be quite stressful to send out an email campaign, as once it has been sent out there is no way to call it back. If there is a typo, a broken link, the wrong subject line or another mistake then you may have to send out another campaign just to correct the first one. 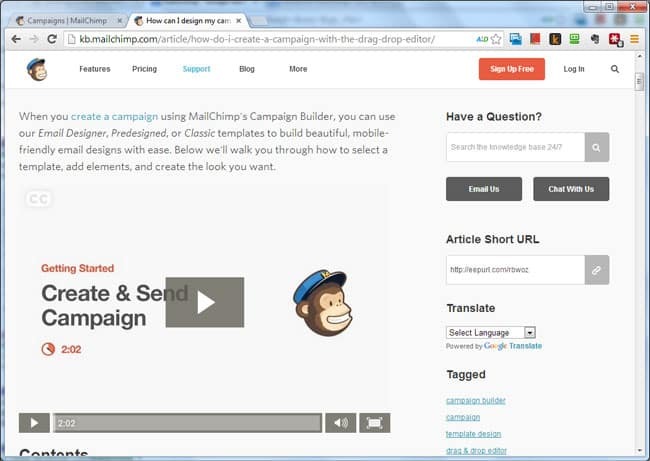 Thankfully MailChimp has a few ways in which you can test your campaign. You can use the pop-up preview (a new window that shows you the email campaign) and you can also test send the campaign to a number of different email addresses. I find it useful to do both so that I can check the spelling /grammar and also see how the email will look in an email client or on a smart phone. 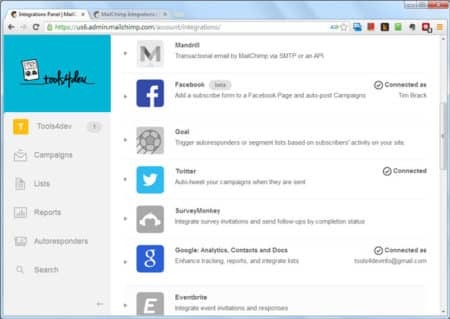 MailChimp has lots of different integrations available so that it can talk to other systems that you might use. One particular integration that I find very useful is to have email subscribers that come from my website automatically sent straight into MailChimp (saving me from having to import them myself). One piece of advice that I can definitely recommend (and this goes for just about any online service that you are considering) is that you test out the entire system first. Run a test campaign so that you can go through all of the steps to see if you’re happy with how each feature of the system works. I would recommend getting someone who is comfortable with online systems and /or websites (maybe even whoever edits your organisation’s website, if you have one) to help get you started on MailChimp. This is by no means a requirement… but it may make setting up on the system easier. If you want a professional or Agency to help you out, no problems… MailChimp has the MailChimp Experts program. You should be able to find someone (maybe even locally to you) who can help you out (at additional cost) with getting set up, creating templates, solving problems and providing recommendations. Duplicate subscribers – One limitation I found is that the same subscriber/contact in multiple lists is counted multiple times towards your overall subscriber count. This becomes an issue if you’re on the pay-per-subscriber model as you might find it useful to create multiple lists where the subscribers overlap. Keep in mind that you can use interest groups, custom fields and segmented lists if you want to send an email to only a subset of your a subscriber list. No Account Manager – Some people/organisations might want an Account Manager to come with their email marketing service. MailChimp is very self-service oriented, although they do have a support team that handles queries and a pretty comprehensive knowledge base. Facebook posted image – This feels like a minor quibble… when you send an email campaign, MailChimp can post this campaign and a message to a Facebook Page for you. This is quite handy as it saves you from having to then login to Facebook and make a post yourself. One issue I found was that MailChimp posts the MailChimp logo… however this was most likely because I was using the free version of MailChimp. 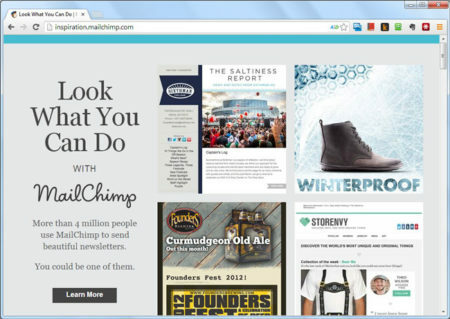 Using a paid version means that your emails do not need to display the MailChimp logo. EDIT: Actually, this is possible which I found out after I posted this article. Instructions are on the MailChimp website. List archive shows all emails – n archive page can be created for each of your lists showing previous campaigns that you’ve sent out (handy for new subscribers). Unfortunately, the archive list shows all of the emails that have been sent to the list and I wanted to be able to control which would appear as not all of them should be visible. MailChimp is a comprehensive, easy-to-use email marketing tool that can help you create and send great looking emails. I’ve also always liked that their service feels like it is being updated fairly regularly with new features.